If you know me (and you probably do, because why would you be reading this if you didn't?) you might be aware that when I go on a road trip, I need two items with me: Pizzeria Pretzel Combos (The cheese snack of NASCAR) and some sort of dehydrated meat product. In light of recent events, I now know what I will be buying if I ever find myself on the road in Anchorage, Alaska. My lovely girlfriend Jayme recently returned from a trip to Alaska, bearing goods both edible and otherwise. Despite her limited meat intake, she was kind enough to bring me an "Alaska Jack's Red Pepper Hunter Steak with Reindeer Meat." After last week's sabbatical I knew my return to the blogosphere had to be really special. I could think of no better way to do that than by consuming some reindeer -- our friends who help Santa bring us gifts at Christmas! I can't wait any longer ... Let me open my present! Upon opening the package, which was thankfully incredibly easy to do -- unlike many kinds of jerky, my nose was filled with a rather typical "summer sausage" odor. And by typical, I mean 100% mouth-watering. The sausage was about the size and color of an overdone 7-11 hotdog (normal ones were a childhood post-church staple for me) without the wrinkles. The rounded ends had been cut off, like a fat cigar ready to be smoked so the flavor lingers on your tongue for hours, no matter how many times you brush your teeth. 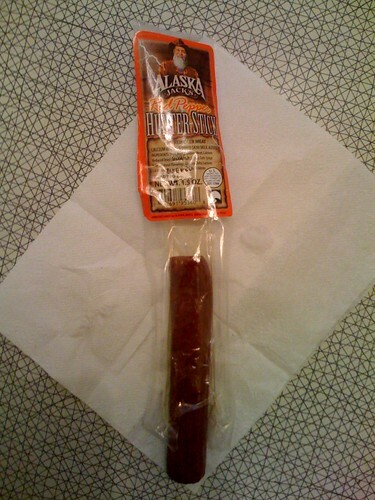 I was hoping the flavor of Alaska Jack's hunter steak would stay with me for an equal period of time. After one bite of the meat cylinder, the aforementioned desire for lingering flavor grew even stronger. The first taste tasted like your typical damn-good non-meal sausage. Then a slight burn developed, grew ever so slightly, and tapered off. I have never tasted reindeer so I can't tell you how it affected the flavor. However, I feel 100% comfortable telling you that I wish this sausage had been two feet long. Perhaps I can persuade Jayme's vegetarian uncle in Anchorage to mail me a crate. I guess the lesson here is that delicious food is key to brevity. "However, I feel 100% comfortable telling you that I wish this sausage had been two feet long." "I have never tasted reindeer so I can't tell you how it affected the flavor." - That magic you tasted...that was the reindeer.